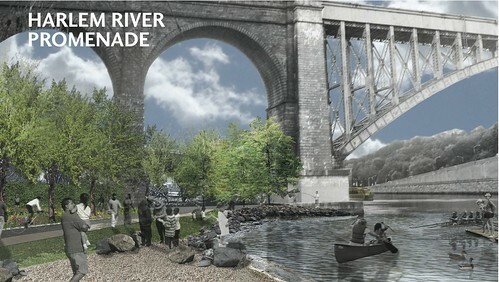 Rendering for one of the Harlem River access sites, click the photo for the full brochure about this one effort. The Harlem River Working Group is a new group focused on improving access to and along the Harlem River — an area stretching 9.3 miles from the Randall’s Island to the Hudson River in Bronx County, New York City. The group’s goal will be work toward restoring the Harlem River; reconnecting the waterfront with the people; recreating the water’s edge; and reinvigorating in-the-water recreational and commercial activities. There is currently only very limited public access open space along the Bronx waterfront, no continuous system of bicycle and pedestrian pathways connecting the waterfront to upland destinations, and extremely limited boat access. We meet every month, the Third Thursday of the month. See our “Events” section of our website, or contact us for more information and to get involved. U.S. Department of the Interior. Expected results include creating linear greenway routes linked to existing on and off street routes, restoring the river’s water quality to swimmable/fishable, protecting and conserving natural habitats, monitoring and publicizing water quality sampling, create new parkland trails and parks both linearly and at the waterfront access points, and organize the community by creating a unified Harlem River Working Group. There are many sites along the HARLEM RIVER ready for further investment. Here is a photo of community members, Parks Department staff and local Council Members at the Park Avenue public location. The Harlem River Valley is a stunning remnant of wilderness in the midst of New York City: a river detour through a forested gorge. This arcadian setting is home to a collection of public works marking the city’s ascendance to global metropolis – from the Roman-style aqueduct that brought water from the Croton to the gravity-defying helix of viaducts and ramps built to tie the urban expressways. Skimming the river and soaring hundreds of feet above it are no less than fifteen bridges that transformed Manhattan into Greater New York. Hugging the narrow shoreline is the railroad, the mode that fueled the city’s growth by linking it to its suburbs and the country’s interior. All of this makes the Harlem River Valley one of the world’s great urban landscapes. A century ago, this improbable pairing of natural and manmade wonders drew crowds of pleasure-seekers to the waterfront. The river was a center for regattas and small boating, for which its flow and depth were ideally suited. And pleasure being a powerful multiplier (a lone rower giving vicarious pleasure to many more), a vibrant economy was built upon the waterfront and its views. On the Bronx side, New York University chose the high bluff for its Promenade of Famous Americans, the focal point of its campus. The spectacle was shared by motorists, train and subway passengers alike, who streamed over and beside the river. Even then, the waterfront was more of a city attraction than a local one. One challenge is to improving the river’s natural resources and its linkage to the East River, Hudson River and New York Harbor Estuary, in the midst of 10% of New York City’s CSO’s. This waterfront has the potential to be a valuable destination for non-motorized commuting and recreation. Its waters have historically been one of the most prolific areas for recreational boating in New York City.